That says WRAPPING, not rapping. So, if you came here to see me sing a down and funky Christmas tune with Andre, you will be sadly disappointed. Andre can't rap, and he also can't wrap, but he at least tries to do the second. 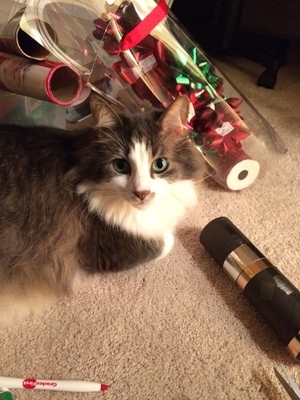 By tries to wrap, I mean that he likes to "kill" just about everything that is needed to wrap a present. Of course, I could just go into a room and close the door and wrap presents without a cat jumping on everything that moves, but WHERE would the challenge be? I'm pretty sure I burn about ten extra calories a minute just from moving the cat and redoing things. So, I have become an expert on this, and I would like to help you learn to wrap your presents and still be a loving kitty mama or papa. Cut out chunk of wrapping paper with cat teeth marks in it. Wrap gift, taping paper as you go. Notice cat fur on tape. Try to peel tape off of paper. Push cat off of package. End up getting nail polish on the tape, too. Wad up paper and throw in trash. Notice cat has tape stuck on paw. Chase the cat to remove tape from paw. Tell the dog to stop chasing the cat with you. Grab cat and remove tape from cat's paw. Go back to wrapping room. Almost stab cat with scissors after he jumps on paper. Move cat off of paper. Cut bitten part of ribbon off. Get a Lysol wipe to clean cat spit off of scissors that touched ribbon. Push cat away with left foot while leaning right to tie ribbon. Wipe cat spit from ribbon. Shriek in pain after cat bites left foot. Apply alcohol and Band-aid to left foot. Notice your foot is still bleeding. Call your husband from your cell phone even though he is downstairs. Go to the hospital to get stitches in your foot. Hobble upstairs to the wrapping room. Close the door so the cat cannot HELP. Listen to the cat beat on the door and yowl. Open the door and let the damn cat in. Call your husband on the phone again and ask for a stiff drink. Gulp down drink and grab the next present. Notice you have Christmas gift bags. Reach for tissue to put in bag. Notice cat is in bag. Lure cat out of bag with tissue paper. Realize you never put a nametag on the first present. Unwrap first present because you forgot whom it was for. Throw first present in gift bag after removing cat again. Put tissue paper in gift bag. Remove that one wet piece of tissue. Throw wet tissue in trash. Wash hands, hoping it was only cat spit again. Notice it is for your son. Grab roll of Santa paper. Accidentally bonk cat on head with present while racing him to the paper. Move unconscious cat over and finish wrapping. See! It's really not tough to get your present wrapping done and be a loving pet parent. Kitties like being involved in everything. Whoever said they just ignore you probably never had a cat. Happy Holidays from Andre and me! Disclaimer: While this was based on a true story, Andre was never unconscious, and I never had to go to the hospital. The rest is true. Liz, there is cat spit on your present, girl. "Where is the damn skinny ribbon?"